We'll use our credit cards so there's no risk to you. Save valuable time and let us monitor auctions for the things you need! 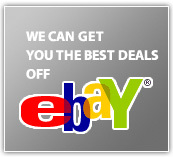 The best deals on the internet can be found on e-bay. If you're not taking advantage of it, let us help you. We can do basic computer set up and repair. Let us help you set up your computer, move information from an old to a new computer, clean your computer from viruses and spyware, set up your internet or a basic network and more.